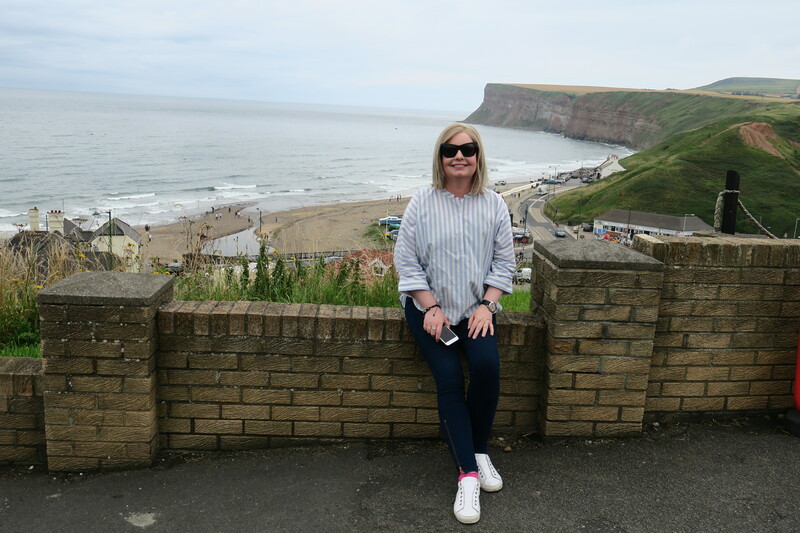 Our first full day in Yorkshire and we drove along the coast from Staithes to the lovely old fashioned seaside resort of Saltburn by the Sea. 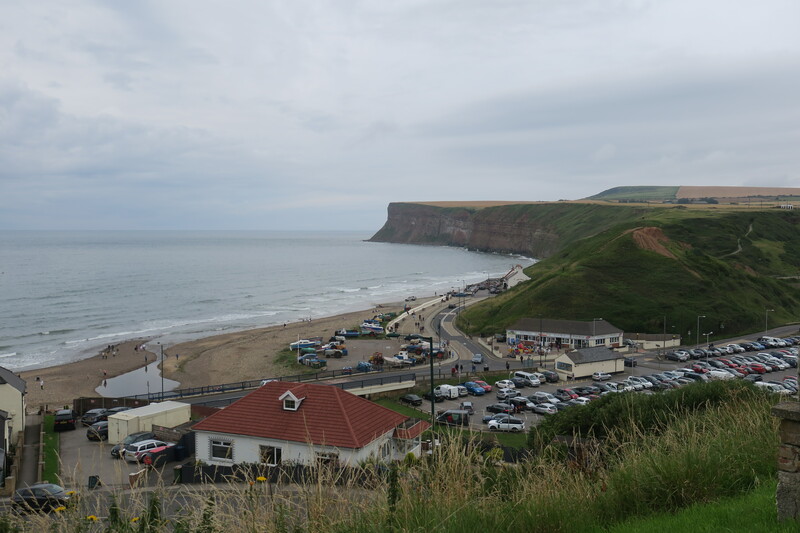 Just twenty minutes easy drive but better than that, it was cloudy, overcast and chilly in Staithes but Saltburn had a (teeny) bit of sun and was a few degrees warmer – it all counts in the great British summertime. This is a town of two halves separated by an incredibly steep and winding hill. At the top there are loads of shops, lovely Victorian houses and some great looking restaurants. Down below there is sea, sand, spectacular cliffs and a lovely old pier. The whole place is small, civilised and old fashioned in the best possible way. 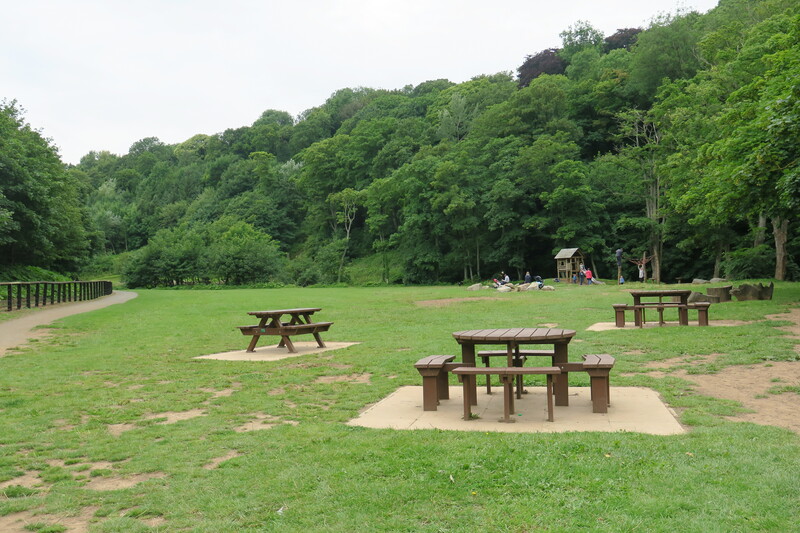 We parked at the top, made our way down that mammoth hill and headed to Saltburn Valley Gardens. 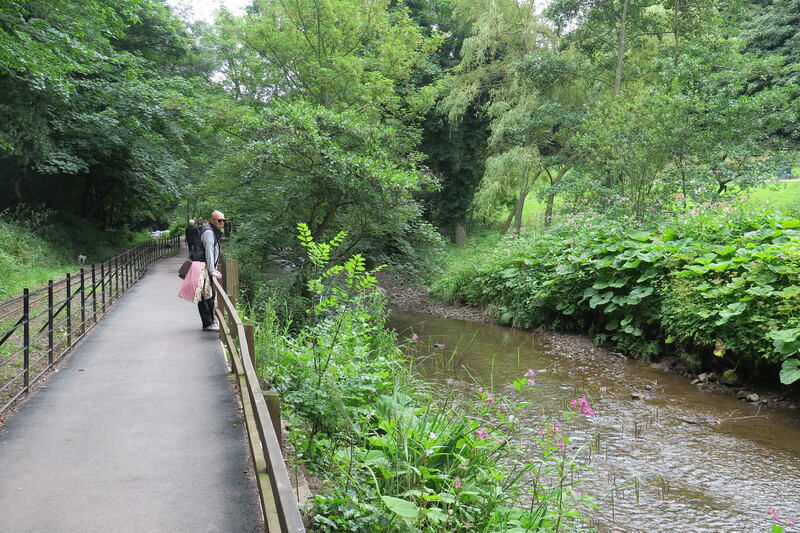 A lovely wooded area cut in half by a little stream – Skelton Beck – we had a relaxing and enjoyable stroll ending up in beautifully landscaped Italian gardens. The Woodland Centre further along is maintained by volunteers and I loved the quirky and alternative vibe here. We could hear a brass band playing in the distance, curious to find out more we followed the music and after a stack of steps and a steep hike we were back at the top of the town – albeit by a different route to earlier. 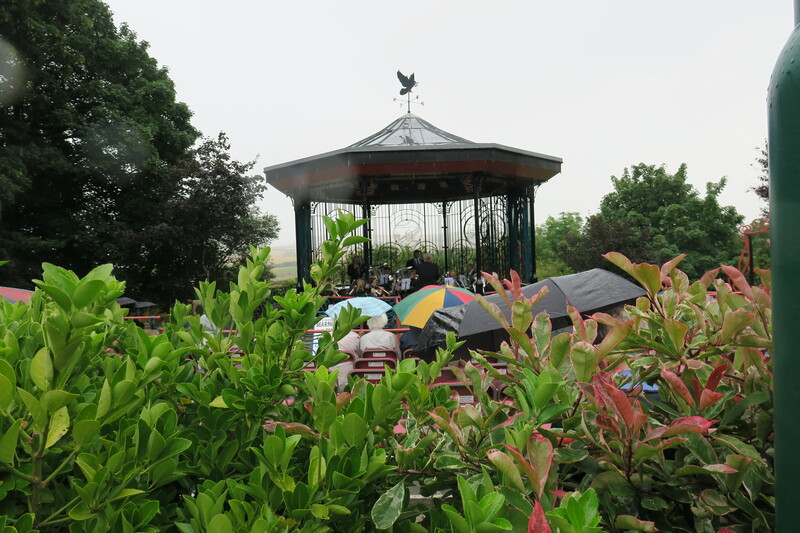 Bearpark and Esh Colliery Band were performing on the bandstand right at the top, we stopped to listen but, like most other observers sheltered under the trees from the by now pouring rain. Only a few hardy sorts were taking advantage of the chairs. 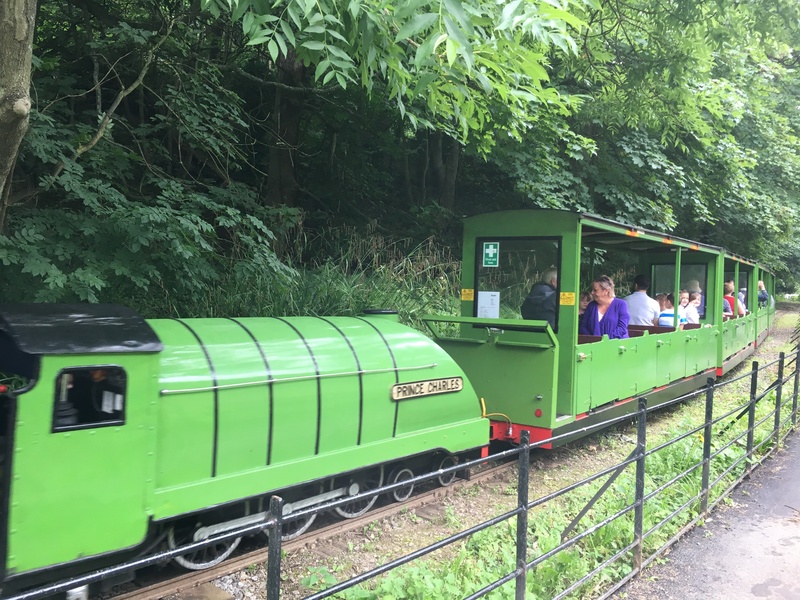 Back down through the gardens again we spied the miniature train whiz past. 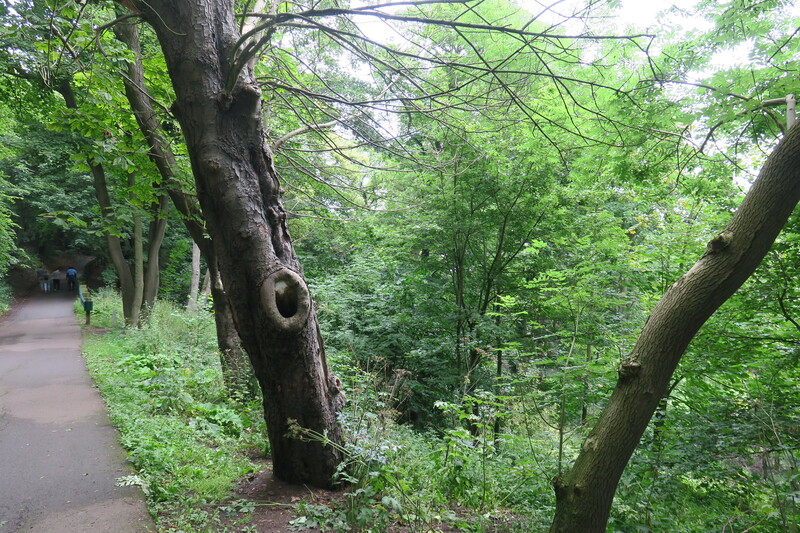 It trundles half a mile from Cat Nab Station to Forest Halt. It was busy with families, we remarked that had Son been here we would probably have been coerced to climb aboard. Today we walked. 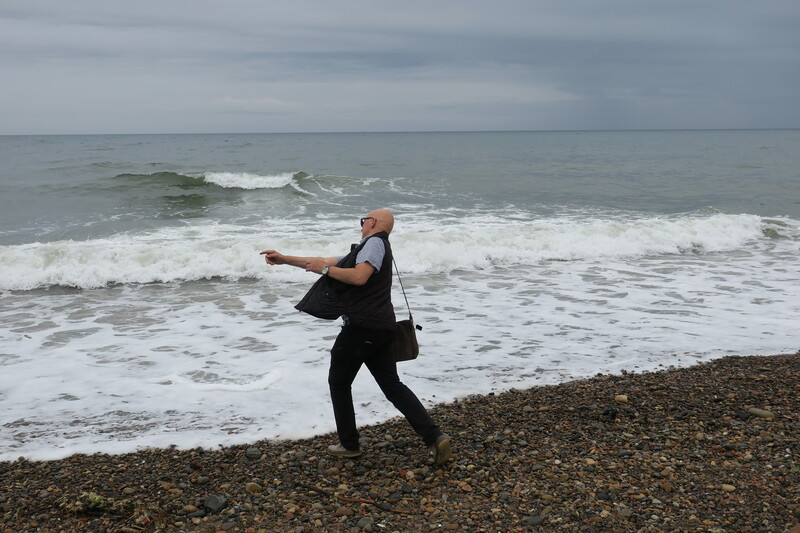 I loved the pebbly beach, we watched some crashing waves and Husband, as ever, could not resist a bit of stone skimming. 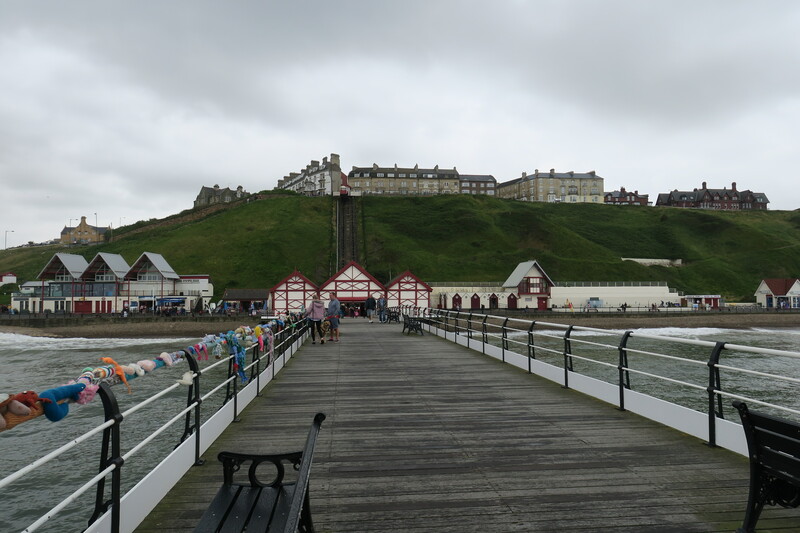 The promenade is lovely, the weather was not the best but we did enjoy watching a lot of brave surfers and checking out the colourful beach huts. A great looking fish and chip restaurant with full length windows looking out to sea caught our eye. There are so many tempting restaurants in Saltburn, I read afterward it is establishing itself as a foodie destination. That is very obvious. 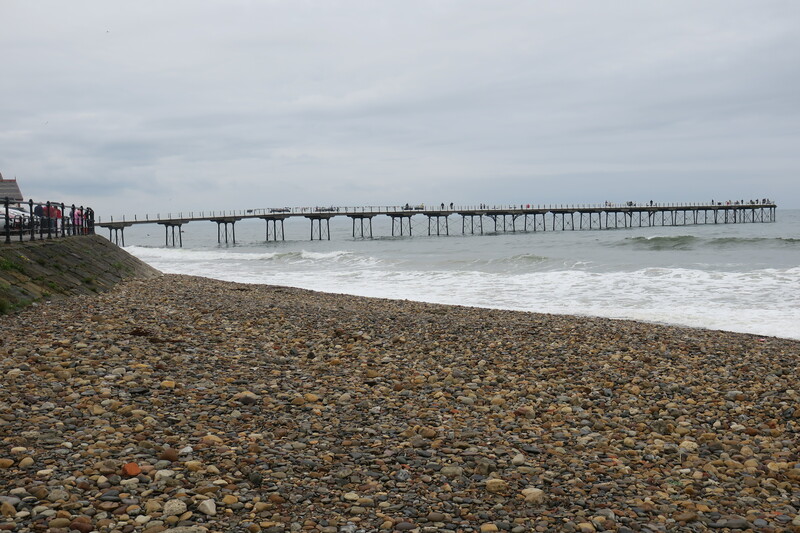 We strolled along the pier right to the end and watched some fishermen. 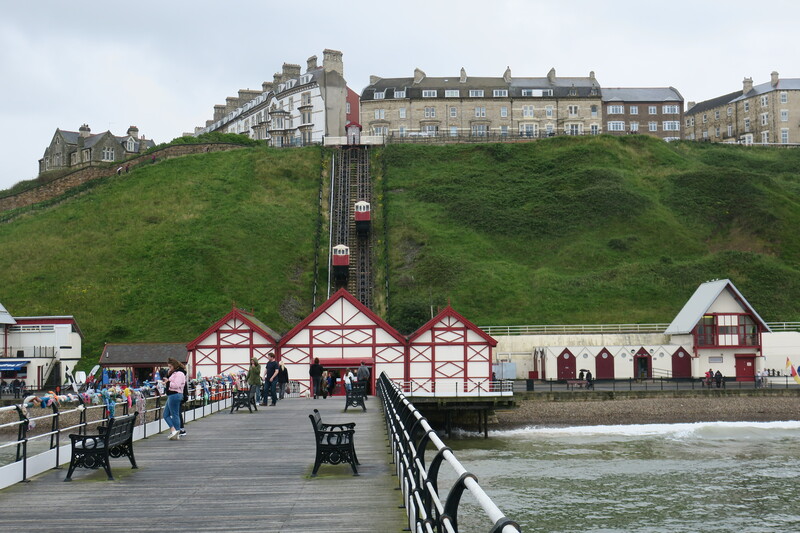 The pier is Grade 2 listed, was built in 1869 and is Britain’s most northerly surviving pier. 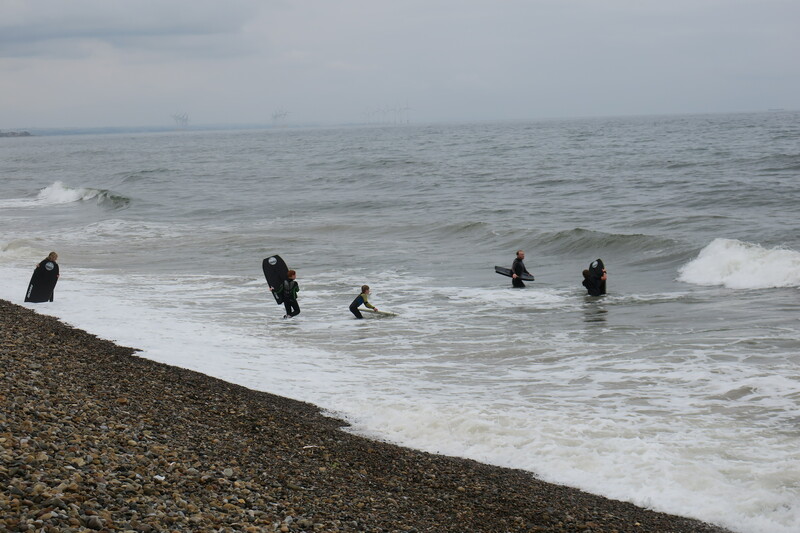 The sea was crashing underneath, I loved looking through the gaps in the wood to the foamy water below. 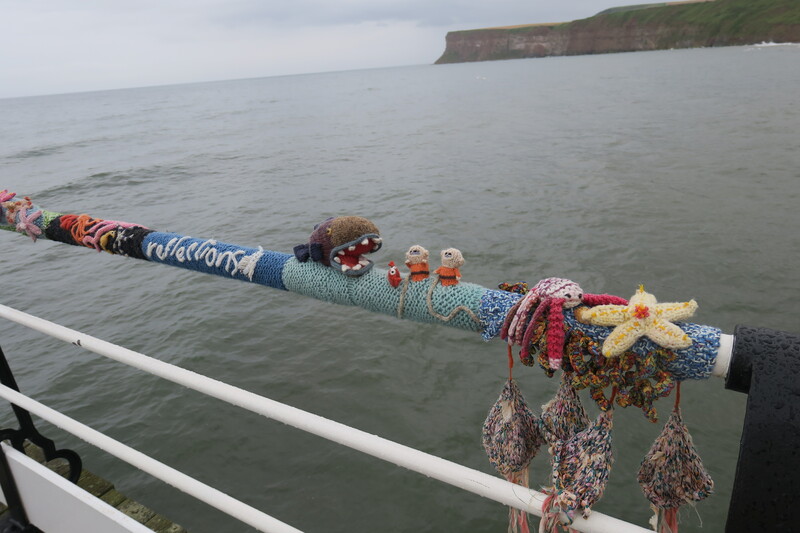 A quirky touch here, the railings of the pier were festooned with all manner of knitted characters. Such a fun touch, the theme seemed to be sea creatures and the attention to detail of each and every one was incredible. 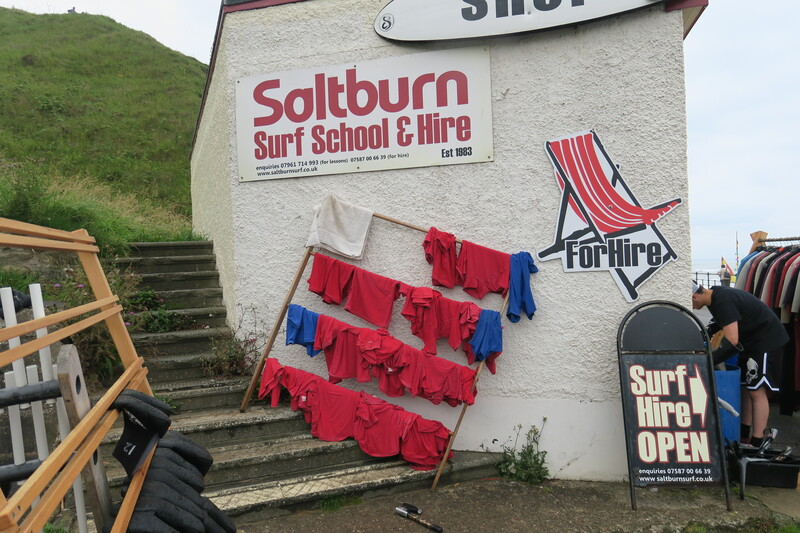 Saltburn must have some seriously skilled knitters. 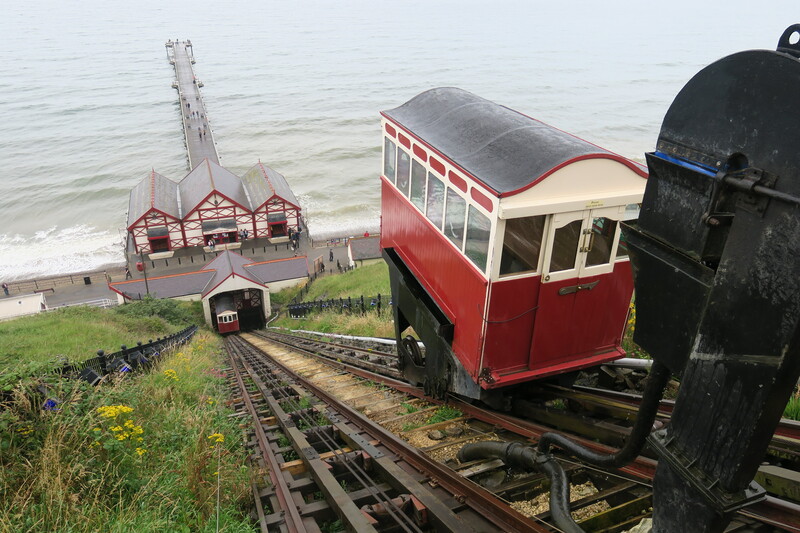 After walking along the pier we took the cliff tram to the top of the town. This Victorian tram is just gorgeous and has been going since 1884. It only cost £1 to ride to the top, a short but fun ride and a good way to climb up 120 feet without any huffing and puffing. We stood for a while at the top taking in the views and watching, mesmerized as the tram went back down again. 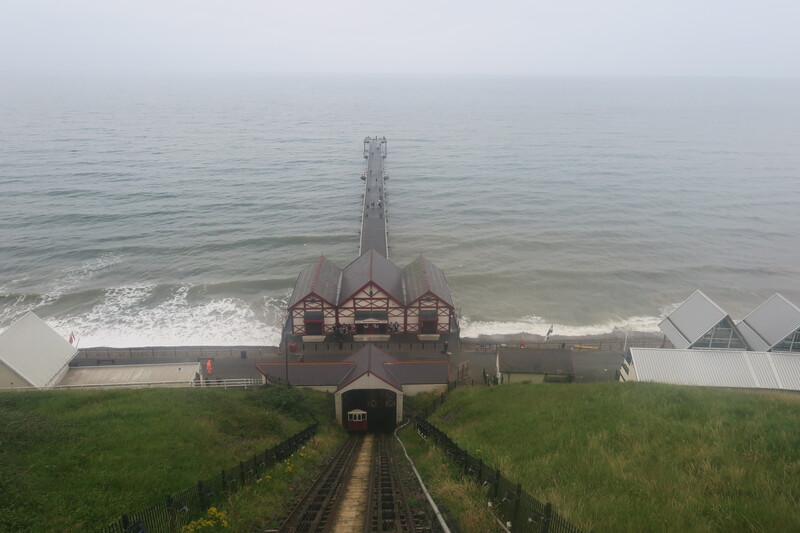 Just a short stroll from here to our car, by this time the rain had started to pound down so we were in agreement it was time to leave Saltburn and return to our cozy cottage in Staithes. A great afternoon exploring this little gem of a resort. 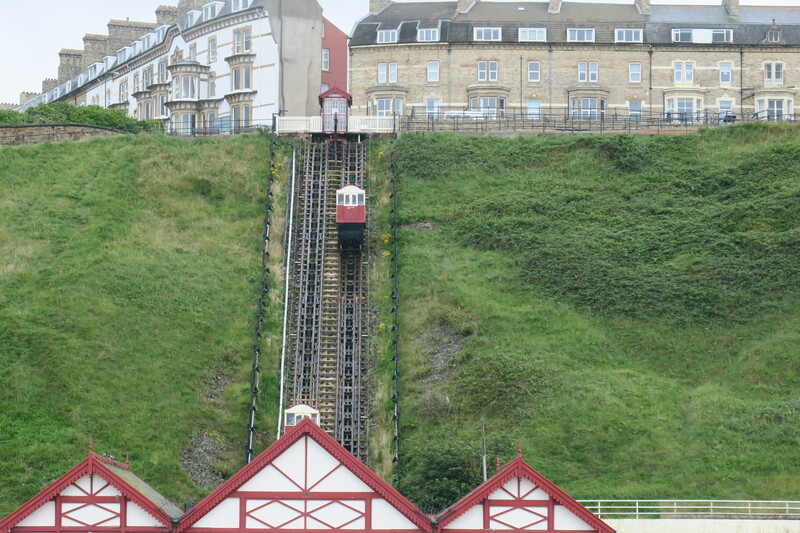 I love the little funicular railway. Ours (in downtown Los Angeles) just started working again. I was able to ride it yesterday. The Minibeast Hotel is a riot. I wonder if the bees and snails and woodlice keep to their own apartments or there is some comingling going on! Although the weather wasn’t so great seems like you had an enjoyable day. 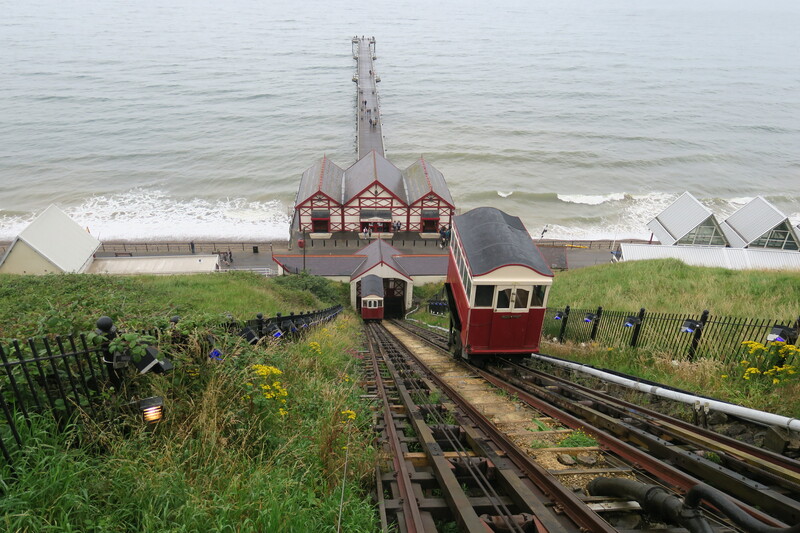 I saw pictures of the funicular in LA recently – it looked fun and the skies were much brighter than here!! 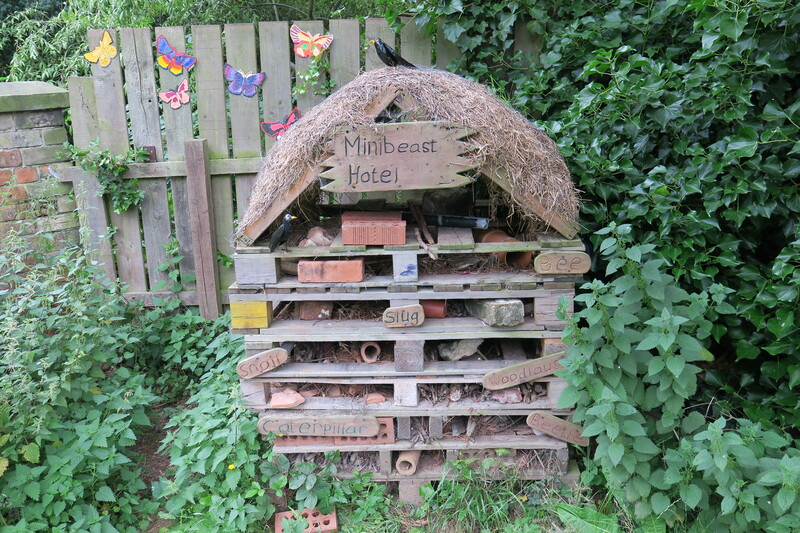 Loved the Minibeast hotel – imagine all those beasts sorting out their own areas!! We did have a lovely day despite the rain. Me too – this one was especially beautiful with its stained glass windows. How fun!! Those pictures are so green it’s so pretty!! 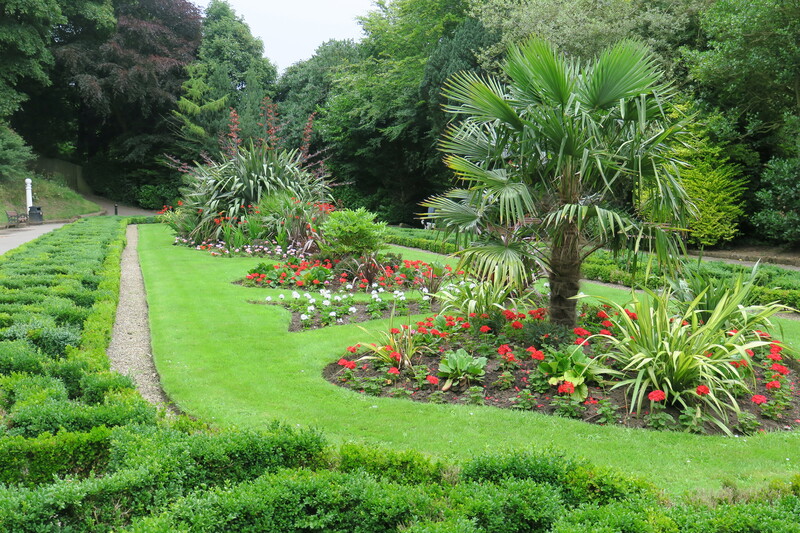 It was lovely, I guess it rains a lot – one of the benefits is everywhere is very green!! 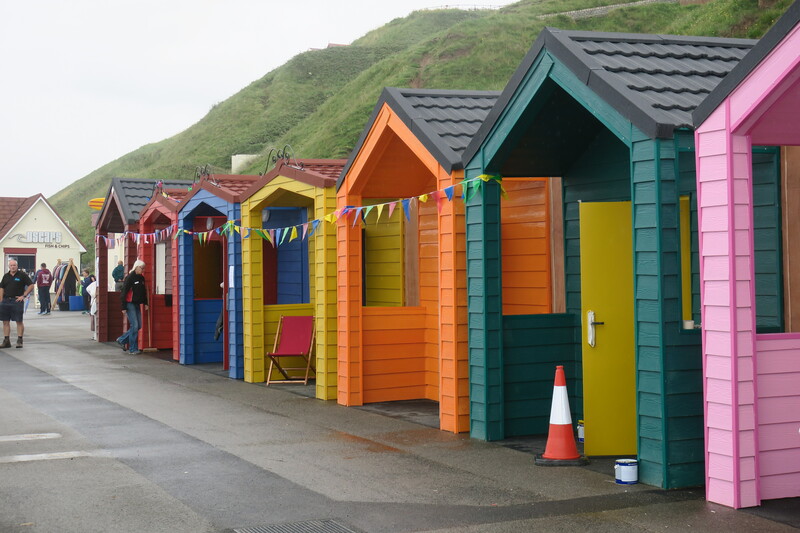 It looks lovely in Saltburn Joy. I’ve not visited there but it’s definitely my sort of place. I loved the knitted bits and pieces adorning the railings. Do you think they survive the damp weather and just gradually dry out? It was a shame about the rain but that’s been the story of our summer. 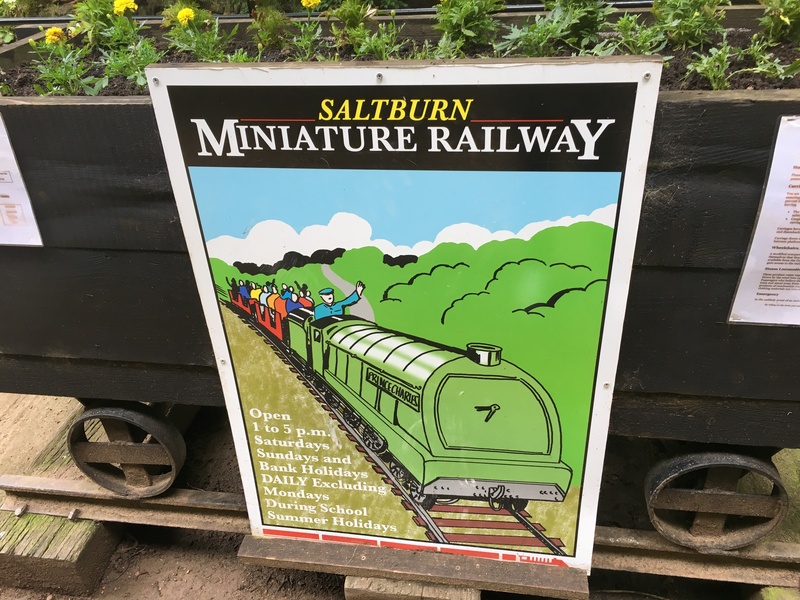 I’d never really heard of Saltburn before our visit Marion. 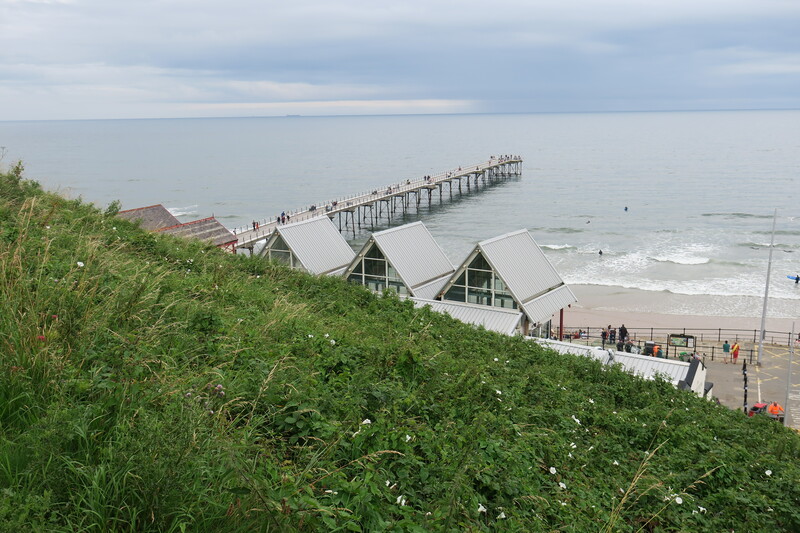 We were looking for a supermarket near Staithes, it came up with one in Saltburn and afterwards as we drove through we both loved it and wanted to come back and explore properly – so glad we did as there was plenty to keep us busy!! 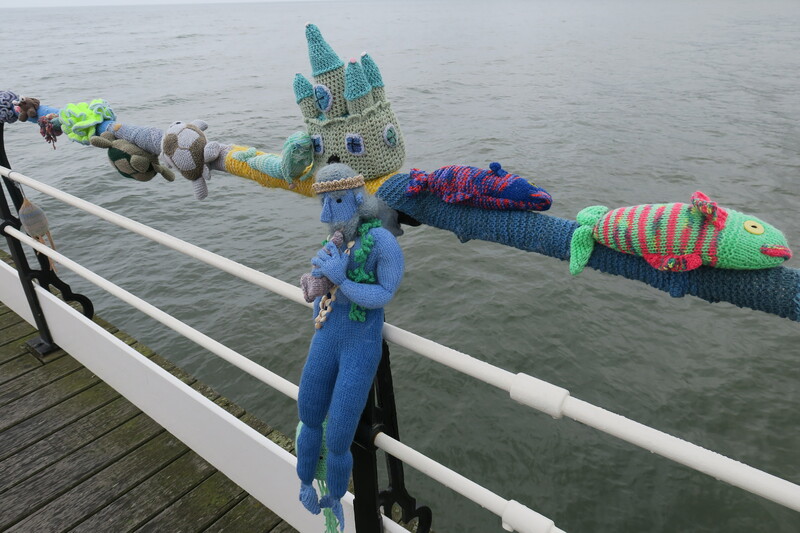 Not sure what happens with the knitted creatures on the pier – they must have got very soggy on that day alone!! Oh the knitted characters are beyond cuteness! Love that!! I loved them too – so intricate and detailed as well, we spent ages checking them out! 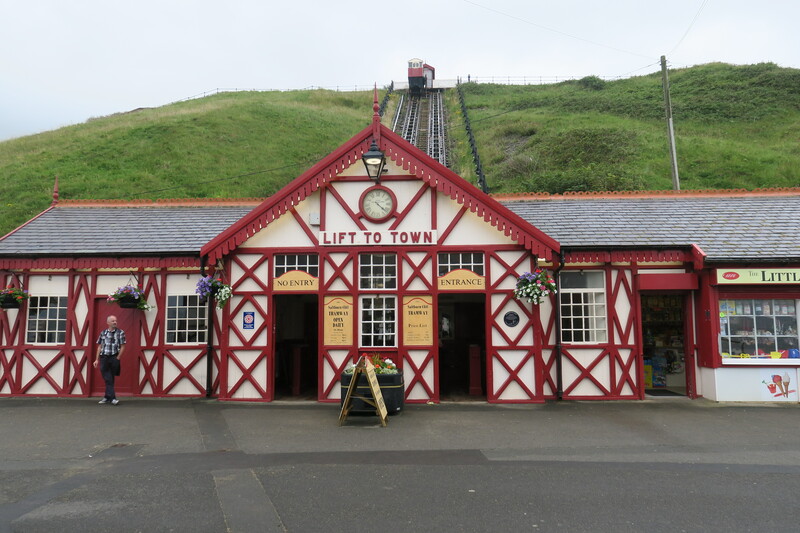 My aunt used to live there and I have visited Saltburn many times, though not since my aunt died in 2012. So happy it is looking so good! Your post has made my day! So pleased to bring back happy memories!! Thank you for the lovely comment. 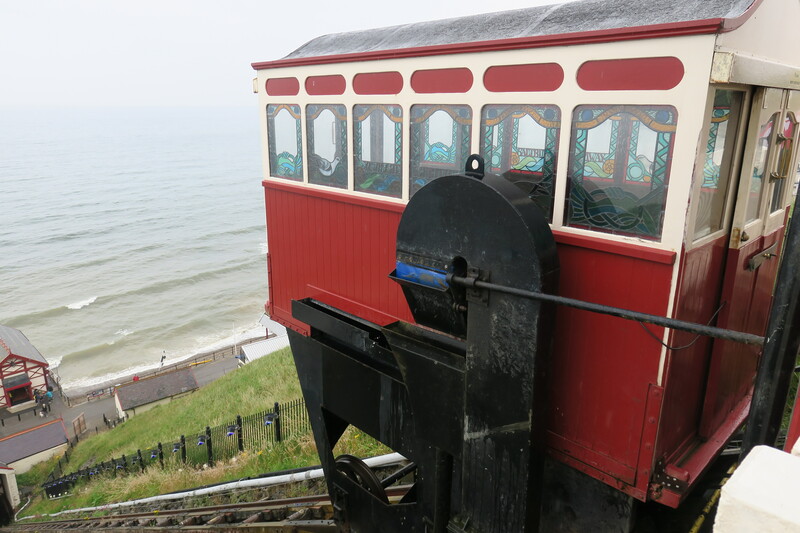 We really enjoyed Saltburn, a bit of an accidental discovery but I’m so glad we spent the day there, we found so much to see and do that interested us. Looks like a good day out. 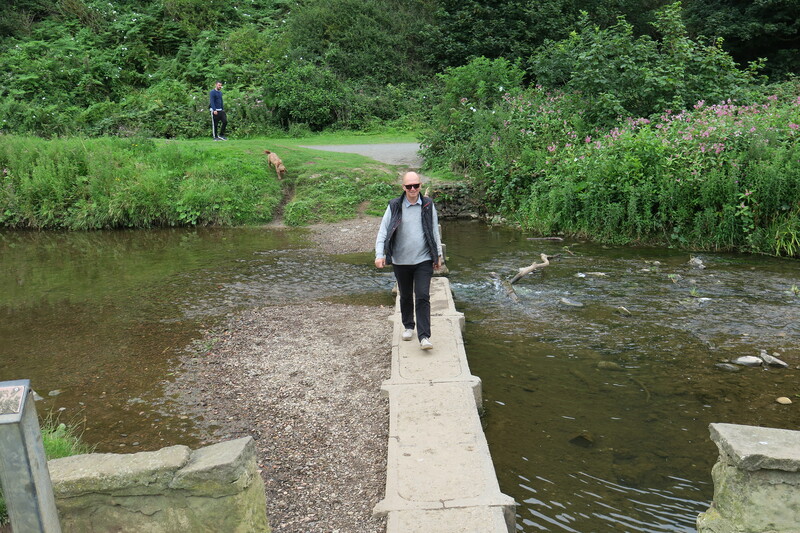 I like a good bit of stone skimming too – more enthusiastic than skilful ! Same in our household – skilful not really a word I would use for us!! It was a great day out, rain and all! A place I have always wanted to visit but I just never seem to get there! 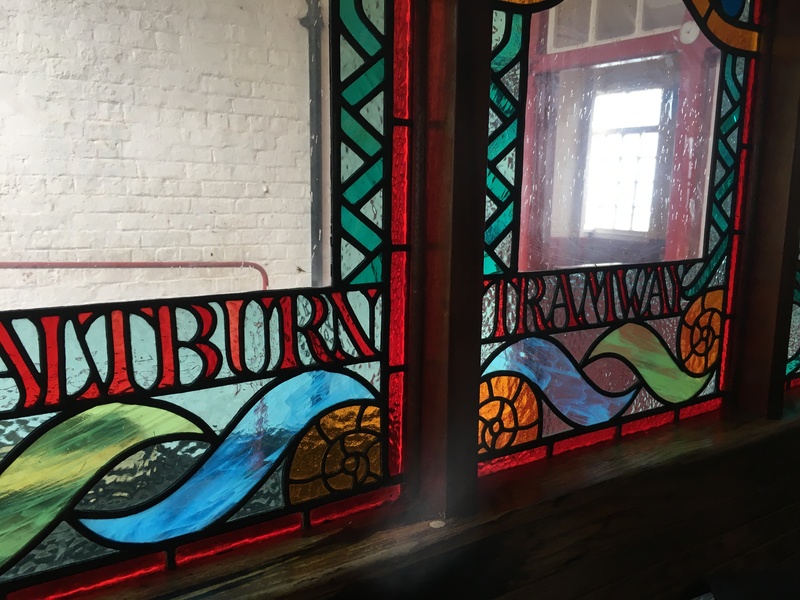 I’d never heard of it before, we passed through on the way to Staithes and decided to go back the next day for a better look around – I’m glad we did. It really was George, I’d never heard of it before but isn’t it wonderful that a place not on your radar can be so much fun to visit. 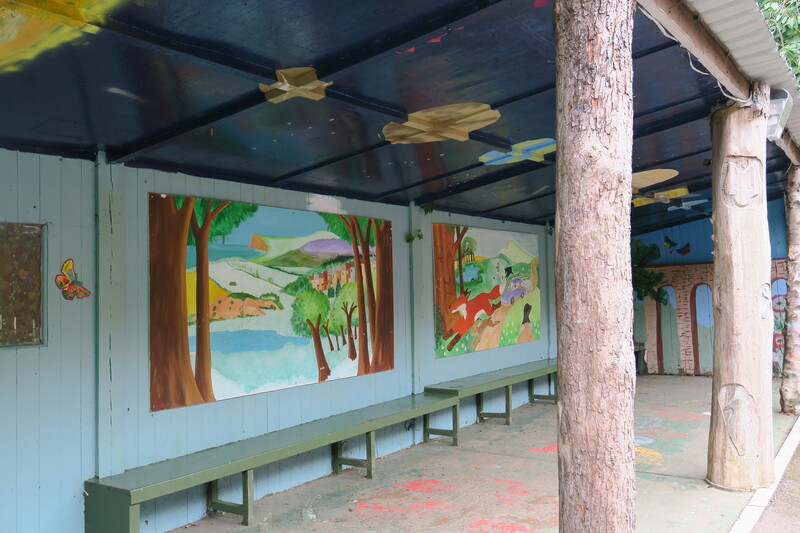 This looks like a delightful spot–you describe it so well! And the yarn bombing on the pier was an unexpected extra! 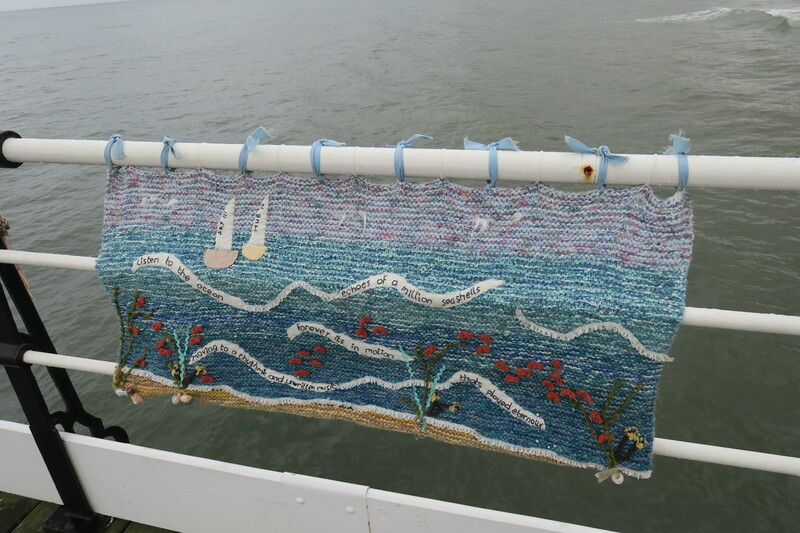 The yarn bombing was my highlight, it was such a fun touch on the pier and those creations were so intricate and detailed. We spent ages there checking them out. What a wonderful little village by the sea! It looks like a great place to explore. The yarn bombing is interesting! We loved the yarn bombing too Pam, such lovely knitted creatures, I spent ages looking at them. This really was a lovely day out. Happy weekend!! The rocky beaches would be such an experience for me! I’ve never seen such a thing. Great post. 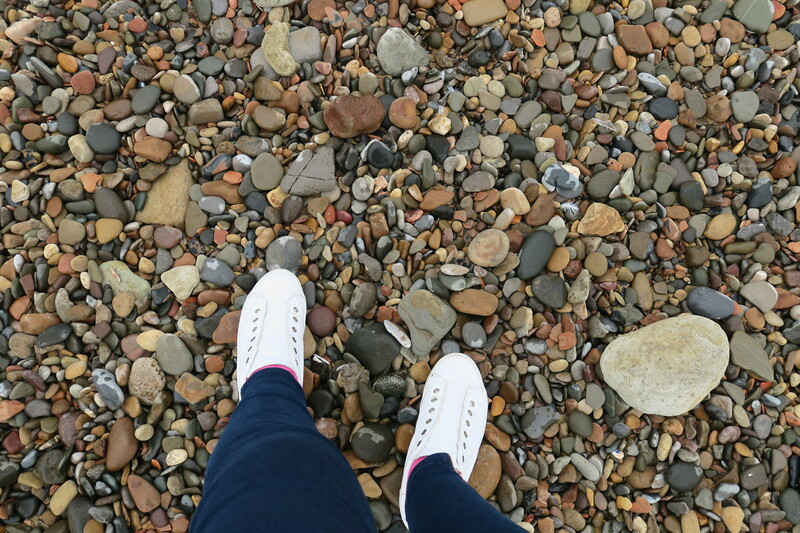 I love beaches with pebbles, they are so different to sandy beaches and so much fun to explore. This one was great! 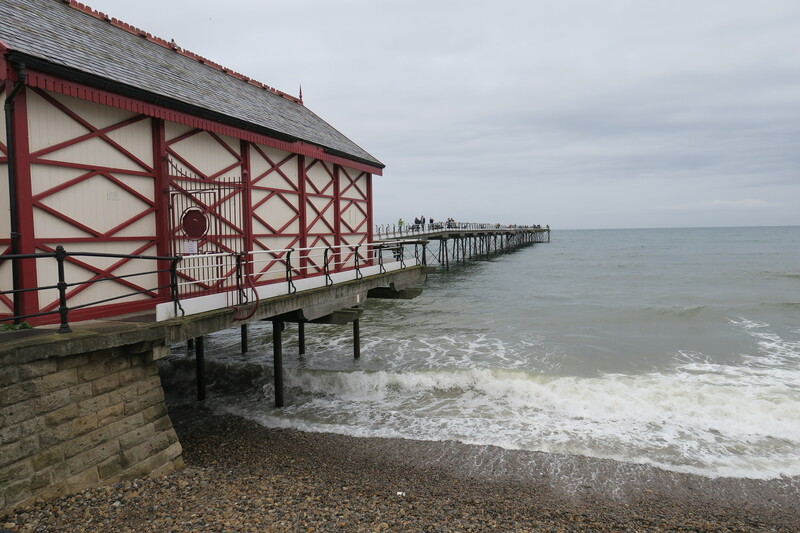 There’s something about these old seaside towns that have a timeless appeal. Looks lovely. 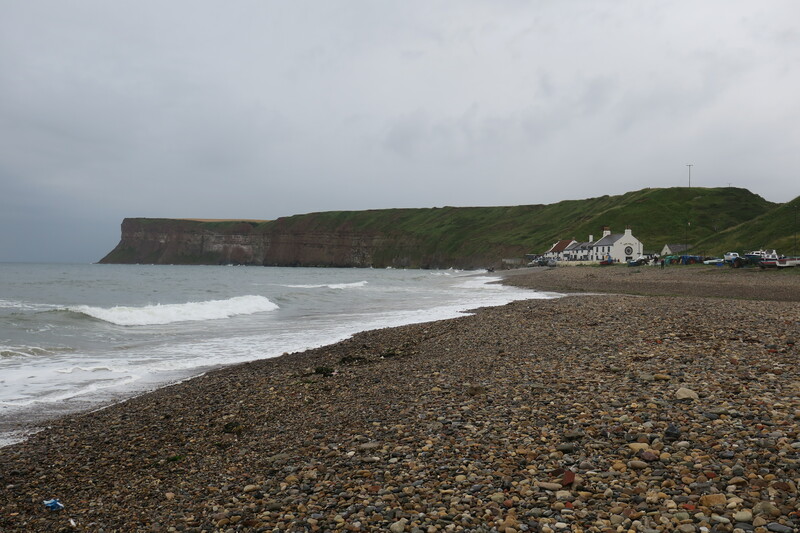 This place really was so unspoiled and timeless – no amusement arcades and pounding noise, just perfect for me! What an interesting town. I’m loving your stories. It was a place we’d never heard of before but turned out to be a real gem and a lovely afternoon! The restaurants all looked so good here Rosemary, the fish and chip shop by the pier looked especially great and I kind of regret now not going back there to dine one evening. 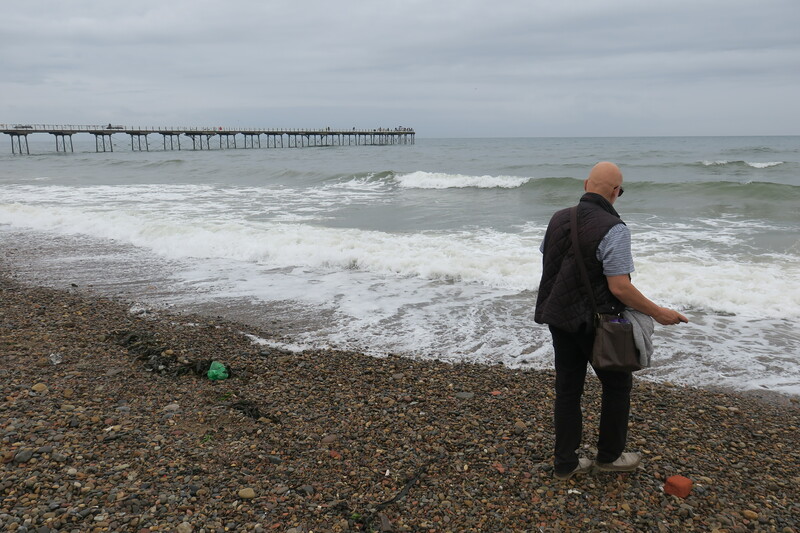 We enjoyed Saltburn a lot but I would not have been brave enough to dip a toe in that water never mind surf!! 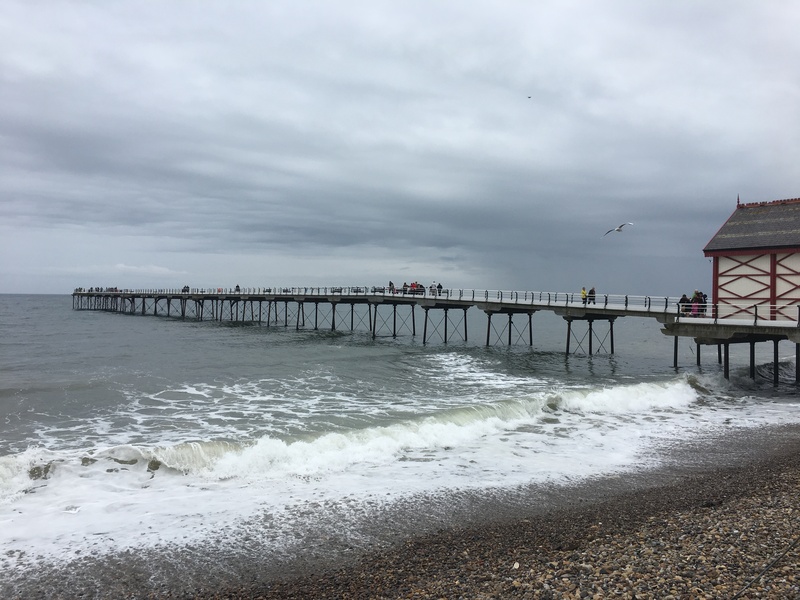 I feel cold thinking about it Joy – always invigorating walking by the sea whatever the weather though! Oh my gosh, what a fun day!! 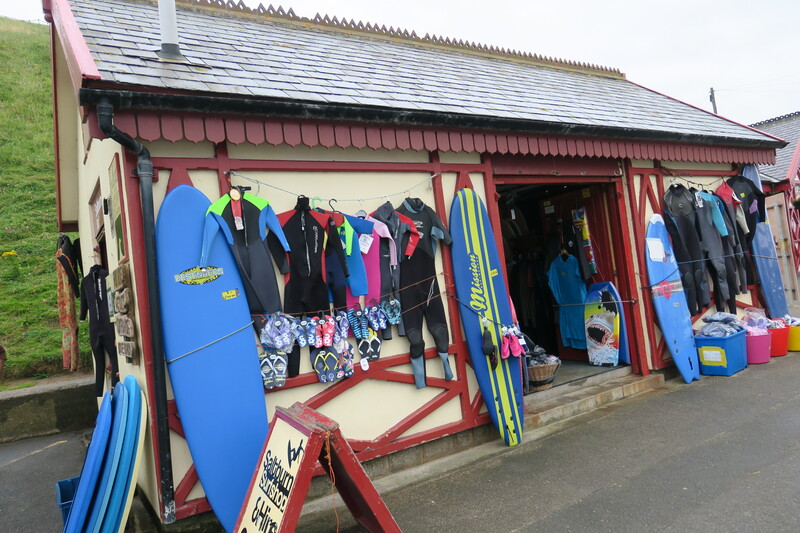 The surfing school, colorful creations on the pier and the funicular all look like so much fun! I wonder if the little “creatures” stay out all year? I wondered that too Hilary, I think they must get a bit soggy with the rain and sea spray but these looked like they were doing ok! Cute! Would love to see it on a sunny day. Unfortunately we didn’t get to do that!!! It was still a nice day though. It is gorgeous and so many things to see and do – I would definitely recommend! Looks like a charming little town! 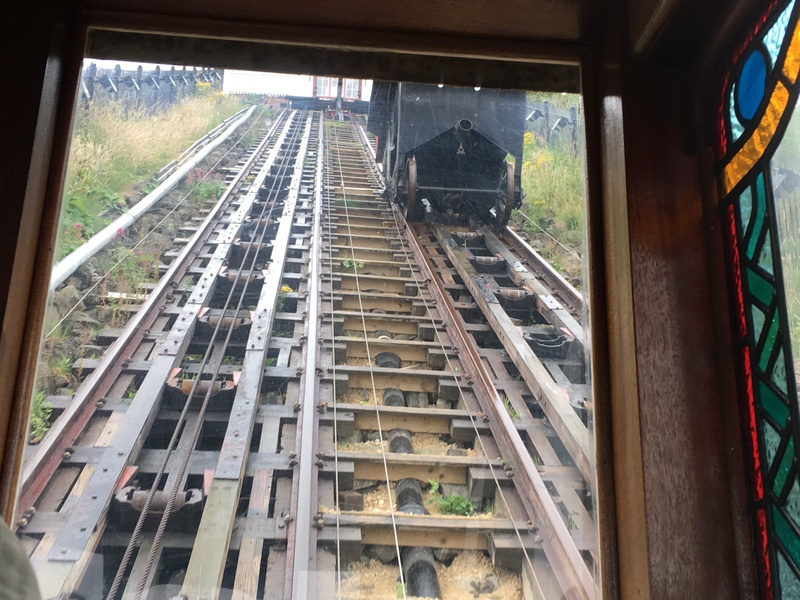 Nice pictures – especially loved the views from the top of the tram line. 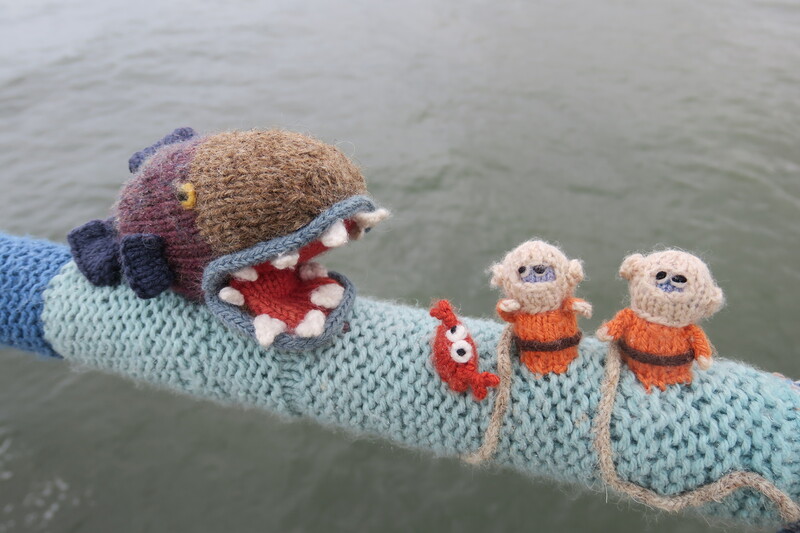 And, those knitted creatures on the pier railing looked so cool, very unique! I loved the knitted creatures too, aren’t they a cool way of decorating a railing!! It was a gorgeous place, perfect for just wandering, the only thing we needed was more sunshine! This really seems like a very picturesque place which I hope to visit very soon. I would love to go there hiking. Are there any good hiking trails? Loads of great trails – along the coast and inland as well, spoilt for choice here really!